Environmental, Health and Safety News: Progress? Over 100 years and electric car tech is new? Progress? Over 100 years and electric car tech is new? Harris & Ewing Before Ford 1906. In 'reality' we can have economic, reliable and abundant electric cars anytime we feel like it. 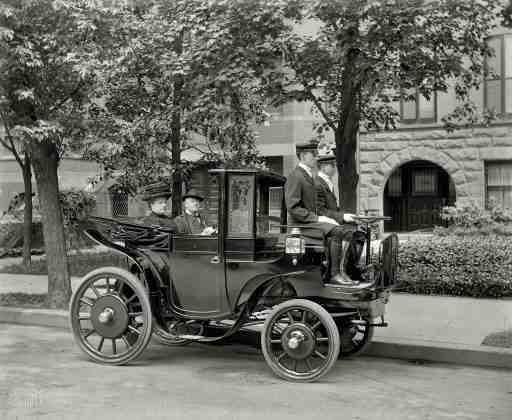 In the late 1890s electric vehicles (EVs) outsold gasoline cars ten to one. EVs dominated the roads and dealer showrooms. Some automobile companies, like Oldsmobile and Studebaker actually started out as successful EV companies, only later did they transition to gasoline-powered vehicles. In fact, the first car dealerships were exclusively for EVs. Early production of EVs, like all cars, was accomplished by hand assembly. In 1910, volume production of gasoline powered cars was achieved with the motorized assembly line. This breakthrough manufacturing process killed off all but the most well-financed car builders. Independents, unable to buy components in volume died off. The infrastructure for electricity was almost non-existent outside of city boundaries – limiting EVs to city-only travel. Another contributing factor to the decline of EVs was the addition of an electric motor (called the starter) to gasoline powered cars – finally removing the need for the difficult and dangerous crank to start the engine. Due to these factors, by the end of World War I, production of electric cars stopped and EVs became niche vehicles – serving as taxis, trucks, delivery vans, and freight handlers. In the late 1960s and early 1970s, there was a rebirth of EVs prompted by concerns about air pollution and the OPEC oil embargo. In the early 1990s, a few major automakers resumed production of EVs – prompted by California ’s landmark Zero Emission Vehicle (ZEV) Mandate. Those EVs were produced in very low volumes – essentially hand-built like their early predecessors. However, as the ZEV mandate was weakened over the years, the automakers stopped making EVs – Toyota was the last major auto maker to stop EV production in 2003. Thanks to the efforts by DontCrush.com some of these production EVs were saved from the crusher.